We did it again…we went to see Harry Potter and the Deathly Hallows Part 2 on an Imax screen…in 3D. Absolutely fantastic and immerseive. So now that I’m back and not at Hogwart’s…I guess I should continue my Horny Goat fest. Beer #238 is Horny Blonde by Horny Goat Brewing Company. Brewed in Wisconsin, like all of the other Horny Goat products, this Light Lager has an ABV of 5%. 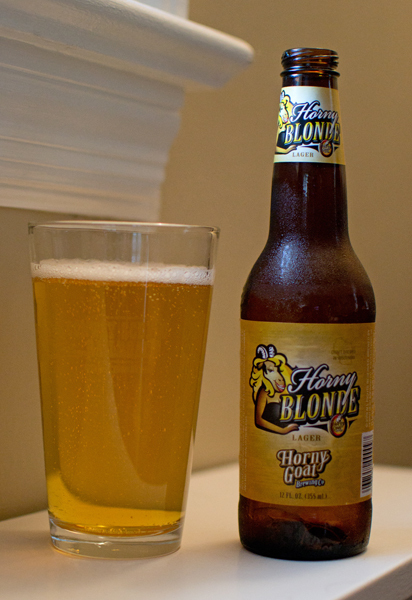 I have to admit…I have always wanted a Horny Blonde…uh oh…did I really go there? Forgive me, I just hope today’s Horny Goat is better than the other three. It couldn’t get much worse, could it? Horny Blonde had a good start appearance wise with a nice clear golden yellow color. There were quite a lot of those lovely tiny bubbles (Don Ho?) rising to the top. There was a just a tiny ring of a white head that actually left some lacing, not the best but it was noticeable. Here was another Horny Goat product with next to nothing in the nose department…maybe just maybe a very, very faint smell of grains. There was nothing else. Those grains showed up in the taste along with a bit of honey and a lemon peel like flavor. It had a light body and it wasn’t nearly as carbonated as it looked (love those tiny bubbles). Another clunker from Horny Goat unless ‘lite’ beers are your thing. I don’t understand the fascination with ‘lite’ beers. Most aren’t worth the price of admission. Oh well…only two more Horny Goat brews left in this fest, a Milk Stout and a Vienna Lager. Stay thirsty my friends… (sorry for the blatant rip off of the Most Interesting Man In The World) !! !